Okay, I’ve been a bit ambitious with the title of this post. We don’t really have any kind of ‘routine’ as such, as B’s sleep is very much baby-led. 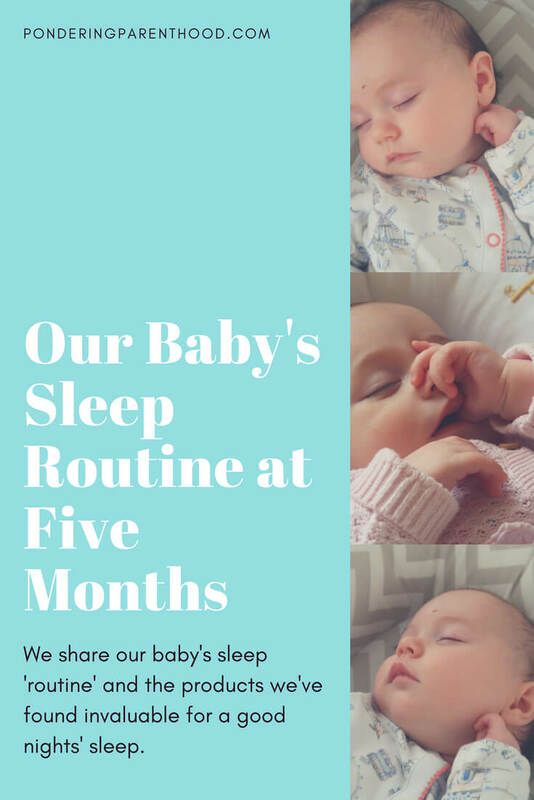 But she has formed a routine of sorts all by herself, so I thought I’d post about it as I’ve found it’s always helpful to hear from other people about what their babies are doing sleep-wise. For context, B turns five months old next week. Bedtime for B is still quite late, as she usually makes the most of her big sister having gone to bed at around 7:30pm, and has a mammoth feed to set her up for the night. Generally, though, she’s fallen asleep for the night any time between 8pm and 9pm. She’ll then usually sleep through until around 6am. Recently, though, she’s been going through a developmental leap, and has been waking at 2am for a quick feed (often no longer than 10 minutes) before going back to sleep. She usually does the same at 6am, returning to sleep for a couple of hours, giving me a chance to have a shower. Invariably, though, her sister (who at 26 months insists on being up between 5:30 and 6am most days – teething has a lot to answer for!) will keep her awake after that 6am feed. Either way, B will usually end up having another nap of around an hour at 11am. 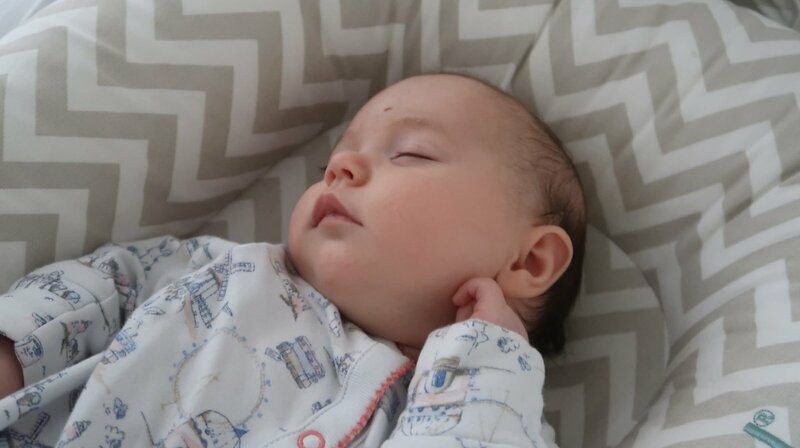 While she then may have sleepy breastfeeds during the afternoon, she won’t usually have another ‘proper’ nap until bedtime, if I try to put her down. Sometimes, I’m lucky and she’ll sleep in her carrycot for around an hour at 5pm, just as we’re eating dinner. If I’m not, I’ll eat dinner with her sitting on my lap or in her bouncy chair. As for products that have helped with B’s sleep, our Sleepyhead Deluxe has been fabulous. We were lucky enough to win ours in a giveaway before I was even pregnant with B, and I’ve bought a lovely chevron cover for it, too, so that we can always have one in use while the other is being washed. 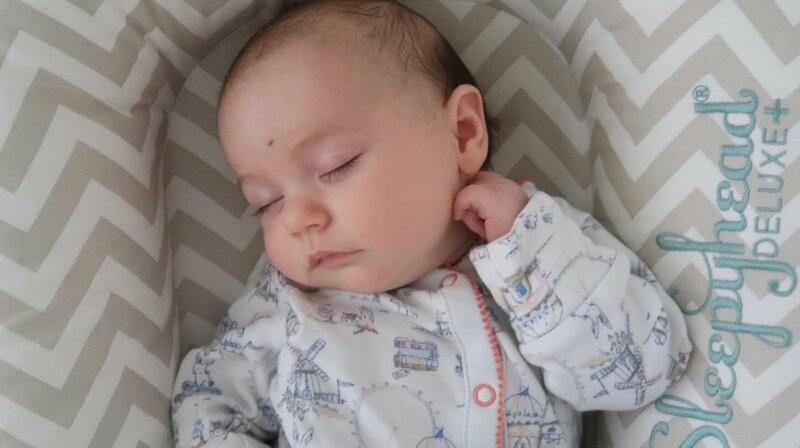 We find the B sleeps much better at night when she’s in her Sleepyhead (which we put in her Snüzpod bedside crib), and have done since she was very small. I also find it really handy to have on the sofa next to me, as it means that I can feel safe in the knowledge that she’s not going to suddenly roll off! It is worth noting here, though, that Sleepyhead recommend the Sleepyhead for use on the floor. That’s exactly what we did when we had a weekend away for my friend’s wedding; B slept beautifully in her Sleepyhead on the floor next to our bed, which meant that we only had to take one travel cot with us for M (our SpaceCot). The Sleepyhead took up barely any space in the car and I love how light it is. It means that I can carry it around the house (our house has three floors so there’s a lot of up-and-down) and always have somewhere safe for B to sleep or just lie awake, watching what we’re all up to! When B was fitted with her Pavlik harness, I was so worried that it would disrupt her sleep, or that we wouldn’t be able to use the Sleepyhead. As it happened, neither of those things were an issue. The Pavlik harness held her knees up, so the sides of the Sleepyhead didn’t interfere with it, and she continued to sleep beautifully. In fact, it’s only since B’s had her harness removed that she’s been a little more restless at night time. I guess she’s adjusting to having more freedom to move her legs! She kept kicking off her covers, so I’ve bought her a couple of Gro Bags to prevent her from kicking them off and getting cold. 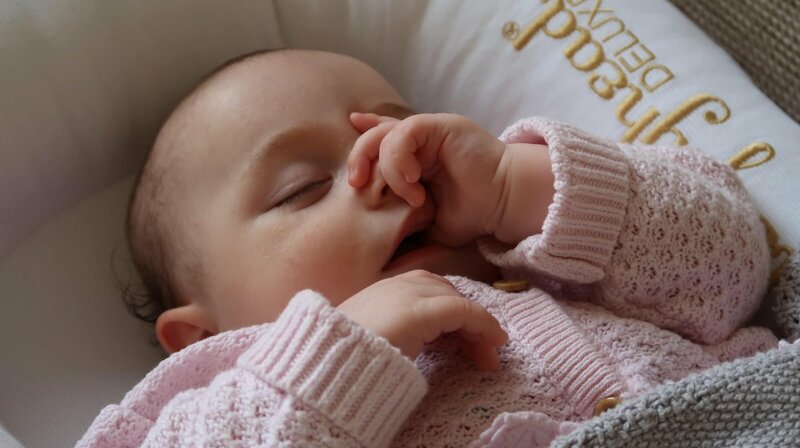 We’ve been lucky with B in that she’s a good sleeper like her sister, and being able to breastfeed second time around has made such a huge difference to the amount of sleep that I’m getting, too. Hopefully once the weather cools down a bit and B finishes going through this leap, she’ll be back to sleeping all the way through the night. Cross your fingers for me! Is your little one a good sleeper? What are your favourite baby bedtime products? Tell me in the comments! "Ponderings on Two – Advice from Georgina Clarke"